What do “decibel” and “hertz” mean? What does “hearing loss” or “hearing impairment” mean? When can noise damage our hearing? Why does hearing get worse with age? What happens if a newborn has a hearing problem? How are hearing impairments diagnosed? What are “otoacoustic emissions” and how are they measured? How does auditory brainstem response (ABR) test work? What are the advantages of doing these tests immediately after birth? The actual organ of hearing is the cochlea in the inner ear. The cochlea receives sound waves and passes them on to the brain. This works smoothly in people with normal hearing. The ears receive sound waves and change them into signals which are sent along nerves to the brain. The brain then analyzes the signals, recognizes them as sounds and interprets them: as soft music, for instance, or as loud honking or human voices. Sound waves are created when an object moves, for example when a guitar string or loudspeaker membrane vibrates. Whether we hear a sound depends both on the power of the sound (“sound level” or “sound pressure level”) as well as on the frequency (or “pitch”) of the vibration. The volume or loudness of a sound is determined by the sound pressure level. The higher this is, the louder the sound is. Sound pressure level is measured in decibels (dB). The word “decibel” comes from “deci” (meaning “one tenth”) and the name of the man who invented the decibel unit, Alexander Graham Bell. The frequency describes how high the pitch of a sound is. It is measured in hertz (Hz), named after the German physicist Heinrich Rudolf Hertz. The frequency is how many vibrations there are per second. For instance, 20 hertz means 20 vibrations per second. This very slow vibration can barely be heard as a very low pitch. The higher the frequency, the higher the pitch. In order for us to be able to hear a sound at all, it has to be above a certain level. This level is called the auditory threshold or hearing threshold. Humans have a hearing threshold of around 0 decibels. Above this threshold, sounds with higher sound pressure levels are heard as louder noises. 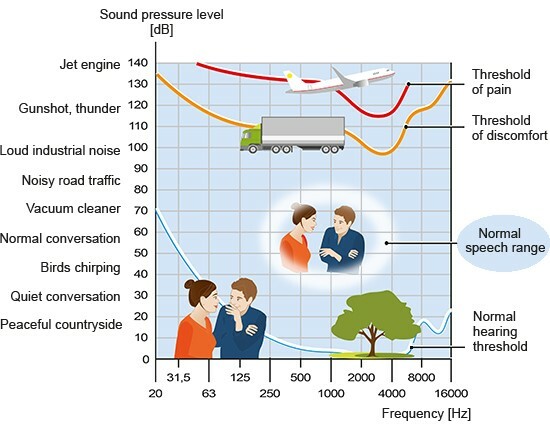 Sounds above 90 dB can lead to chronic hearing damage if people are exposed to them every day or all the time. Hearing becomes uncomfortable if the sound pressure level is above 110 decibels (threshold of discomfort), and it becomes painful above 130 decibels (threshold of pain). Sounds louder than 130 dB can cause acute hearing loss. When someone is hard of hearing, their hearing still works, but not as well as usual. Hearing loss may be permanent or temporary, already present at birth, or develop following an illness. It often occurs in older people. Mild hearing loss: Hearing loss of 20 to 40 decibels. Moderate hearing loss: Hearing loss of 41 to 60 decibels. Severe hearing loss: Hearing loss of 61 to 80 decibels. Profound hearing loss or deafness: Hearing loss of more than 81 decibels. A hearing loss of more than 40 decibels is considered to be a hearing impairment. Our ears are constantly exposed to sounds, some of which can be damaging. Noise above 140 decibels, like a loud explosion, can lead to acute hearing loss. If the sound waves damage the eardrum, the middle ear and/or the inner ear, it is known as an acoustic trauma. This kind of damage is usually temporary, but some hearing loss may be permanent. Chronic hearing loss can also be caused by less loud sounds (about 90 dB and above) if someone is regularly exposed to them. Examples include hearing impairments caused by listening to loud music a lot (for example, through headphones), or working with pneumatic drills without enough ear protection. You can protect your hearing in various ways. Foam ear plugs offer protection against occasional noise. Acoustic ear muffs are an alternative. They completely cover both ears and are easy to put on and take off. People who work with loud machinery, for instance in industry or road building, have to use hearing protection. It's very common for people’s hearing to get worse as they get older. About 25 to 40 out of 100 people over the age of 65 are affected. Half of all people above the age of 75, and 80% of 80-year-olds, are hard of hearing. This usually affects their ability to understand what people are saying more than the range of tones they can hear, and they can hear low frequencies better than high frequencies. That's why people with age-related hearing loss find it particularly difficult to follow conversations in noisy environments. The exact causes of age-related hearing loss aren't known. Changes in the inner ear and brain are thought to play a role. Nowadays, there are various sound-amplifying hearing aids that improve people’s hearing and help them understand conversations. All of these hearing aids filter out background noise. They are adapted to the individual needs of their wearer and can be worn behind or in the ear, where they are hardly visible. Bance M. Hearing and aging. CMAJ 2007; 176(7): 925-927. Thews G, Mutschler E, Vaupel P. Anatomie, Physiologie, Pathophysiologie des Menschen. Stuttgart: Wissenschaftliche Verlagsgesellschaft; 1999.